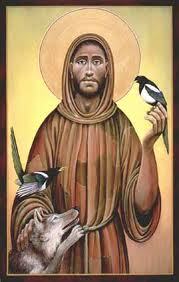 Every so often I have to read another book about St. Francis of Assisi. Eight hundred years later his story of utter conversion, utter transformation into the very heart of Christ, still stuns me. 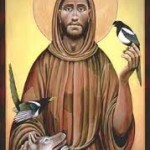 This year’s book is Julien Green’s wondrous God’s Fool: The Life and Times of Francis of Assisi. Stuffed to the point of vomiting, the guests went off to defile the public squares with their drunken songs. And who was that following them, with his fool’s baton in hand, but Francesco, the king of the feast? All of a sudden he stopped. What had happened? In the middle of that sorry feast, Francis had fallen in love. For years he had been fleeing someone or something, and suddenly that Someone had caught up with him and blasted him with all the power of his tenderness. Francis was twenty-five years old. Within weeks of that encounter Francis sold everything and gave it to the poor. Overjoyed and filled with the utter fullness of God, he found the treasures of heaven. As I read this book I drew as closely to him as I dared, and caught a glimpse of those treasures. And now comes today’s gospel, with its warnings against wealth (and I confess I love wealth) because it can distract us from drawing as near as we can to Christ. Help! The Hound of Heaven is chasing me. Do the greatest joys of your life have anything to do with money?